Across all genres, from documentary to horror, action to romance, 2017 has been a fantastic year for cinema. Reviewing each movie category, it is a real challenge to narrow down the must-see films. Icare is nine years old. He prefers to be called Courgette, the nickname his mother gave him. After her sudden death, Courgette meets a policeman called Raymond who takes him to a foster home. There, Courgette meets a group of children who, like him, believe they have nobody left to love them. Together they form a strong bond, supporting each other - becoming a family. This is a movie with huge emotional power. I left the cinema deeply moved by My Life As A Courgette. However, while he does not shy away from many difficult issues, Barras aims to capture your heart not your tears. It all starts at daybreak as three young surfers take to the seas. A few hours later, on the way home, a terrible accident occurs and 17 year old Simon (Gabin Verdet) is left hooked up to life-support machines in a hospital in Le Havre. Meanwhile, in Paris, a woman awaits the organ transplant that will give her a new lease on life. Heal The Living is a stunning film about life and death, hope and loss. I loved it - even as it moved me to tears. Dunkirk is a breathtakingly intense thriller. Dunkirk is both visually and aurally stunning - a deeply moving story brought to life by a superb cast and told via tales of land, air and sea. When Emily is beset with a mystery illness, Kumail has to navigate the medical crisis with her parents, Beth and Terry (Holly Hunter and Ray Romano), while dealing with the emotional tug-of-war between family obligations and his heart. Beautifully shot and featuring a host of powerful performances, Moonlight is a deeply intimate story with undeniably universal themes. Based on director Barry Jenkins’ own experiences and inspired by Tarell Alvin McCraney’s play, In Moonlight Black Boys Look Blue, Chiron’s journey feels like an important tale for our times. What Are Your Favourite Movies Of 2017? 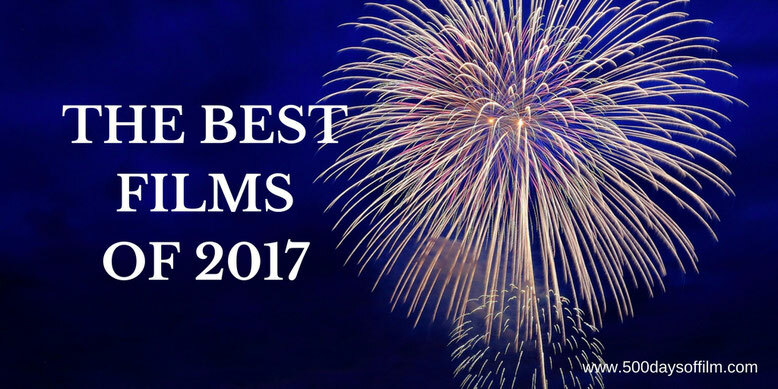 Well, that is my list... what movies would make your list of the best movies of 2017? Let me know! Leave me your selections in the box below or let's talk must see films over on Facebook or Twitter (@500DaysOfFilm).